The Ford Pinto was a car that in its day was considered to be nothing more than good basic transport. Over subsequent years it has come to be a more desirable car, and as numbers have dwindled due to natural attrition they have begun to develop something of a following. 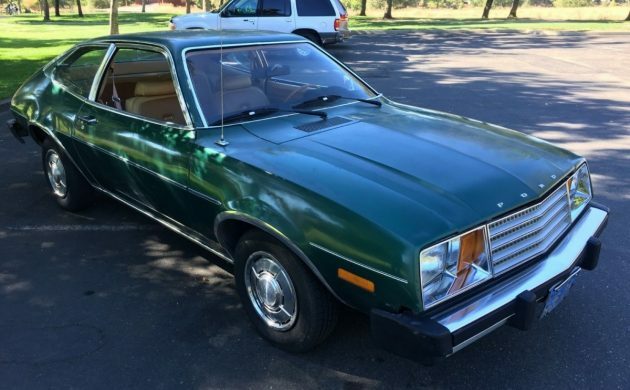 You will find this 1979 Pinto listed for sale here on eBay. Located in Elk Grove, California, it is listed with a clear title. This is a No Reserve auction and bidding has reached $2,025 with about a week to go. Finished in the factory color of Dark Jade, this Pinto looks to be in good condition. 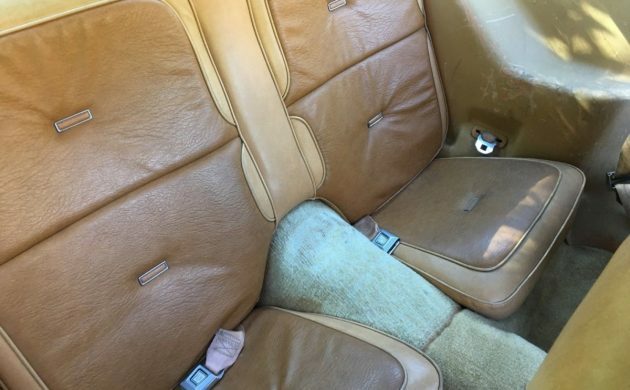 Certainly, there doesn’t appear to be any problems with obvious rust on this car, and the seller supplies a photo of the trunk floor which looks close to perfect. I suspect that the deck lid may have been repainted at some stage as the color looks to be slightly different to the rest of the car. All of the external trim appears to be in good condition although the rear bumper filler panel has warped a bit over time. 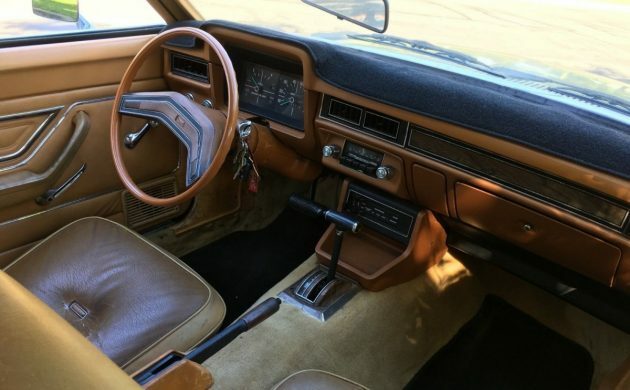 The interior seems to be clean and original for what is essentially a volume-built car from the 1970s. We don’t know what’s hiding under the dash mat but the rest of the dash appears to be in good condition. There is some wear on the steering wheel and the arm-rests on the doors, some peeling of the chrome on some of the plastic trim pieces and some deterioration of the plastic around the parking brake, but otherwise, it looks pretty good. The rear seat is also in nice condition. I can’t see any obvious signs of wear, tears or staining. The plastic trim in the rear is suffering from the same deterioration as that noted in the front which seems to be par for the course for hard plastic trim in cars from the 1970s. Under the hood is the standard 2.3 liter OHC engine which is backed by the automatic transmission. This means that the car is no jet, but produced adequate power to function as a practical daily driver. This little Pinto has been optioned with power steering, power disc brakes, and factory air conditioning. The seller does not mention how well the car goes, and the only real issue visible is some corrosion around the battery region which I would probably address before it gets too bad. 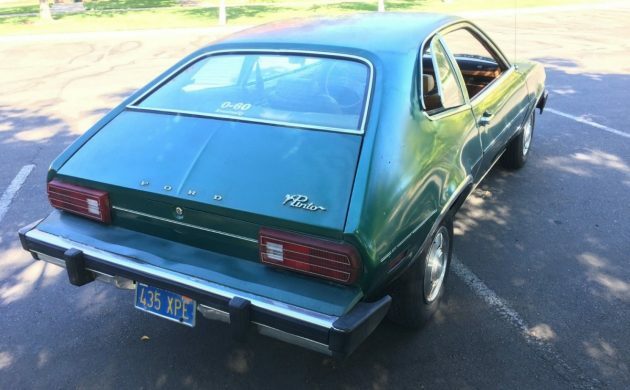 When I was looking at this car I honestly thought that it would be really easy to determine a realistic value for it as there are plenty of Pintos on the market at the moment. 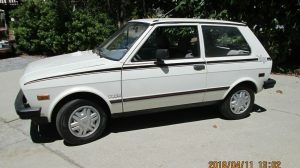 Then I made a surprising discovery: While there is a multitude of Wagons and Runabouts out there, there are precious few of the 2-door sedan versions for sale. That may make this a slightly rarer and more desirable car. 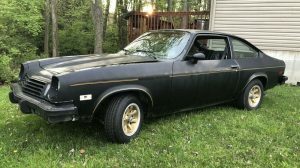 Whether it will ever become ultra collectible is questionable, but if you were looking for something slightly different to the average Pinto that you see on the street, then maybe this is the car. Ka-BOOM,,,there, now that we got that out of the way, the Pinto was a good car, and this is an outstanding example. I tend to disagree with the seller, claiming this is the more desirable “trunk model”, more like rare because everybody wanted the hatchback, and for good reason, carry a lot more stuff. The 2.3 was never meant to haul 4 overweight passengers across the desert with the a/c on, but it did ok with 2 people, or with small kids. It was just what America needed, and filled the role well. Nobody saved one. There was usually nothing left to save. And for the record, that whole gas tank thing was nothing but baloney. Like the minivan, say what you will, but you can’t argue with a car that sold over 3 million units,,,and the amazing thing, is virtually none are left. Probably one of the sharper examples left. Insert cute gas tank comment here. Good point on the 55mph rear guardrail. Plus the problem cars were 71-75 or 76. Ask any Pinto owner, that plastic filler panel between the body and the bumper always warped. Still miss my Pinto, 175 K and never replaced the clutch or any other major component. It was a great car. My family mostly owned VWs or Toyotas back then, although my stepmother had a Maverick and a Fairmont, so I didn’t realize the Pinto had rear buckets with the driveshaft hump between them. I could excuse this in a Mustang or Camaro, but not in a “family car!” There might not have been much leg room in a Beetle or Rabbit or Corolla, but at least back seat passengers weren’t an afterthought like this. I don’t know what American designers were thinking. I still see Pintos and Bobcats now & then, they were fairly tough; and the engine probably still lives on–I drove an industrial floor cleaner in the ’90s that had an LP version. But frankly, I don’t miss them, and there are so many nicer old cars out there. I also don’t consider the non-refundable hatchback to be a plus. If I had to have one, I’d pick a wagon. I’d rather ride in the back of a Pinto than any Beetle…..the 1937 design did not allow for adult headroom. I’d prefer not to be in an accident at all, but I’d chose a Pinto any day before the death trap Beetle. Andy, I don’t think the rear seat was designed like that for sportiness. I think it was designed like that because of the room they had to work with. Exactly. Same as on the H Body Monzas and derivatives. No one would expect a fifth passenger to ride back there. Even the GM J cars after 82 had a divider in the back seat. These were four passenger cars. Friend fixed up a pinto for his daughter to drive to school. One day they packed the car with 9 kids for a joyride, and got rear ended. No one hurt and the gas tank didn’t rupture, Bud had it towed to his house. gas tank split the next dat while sitting in the yard. Divine Intervention? I’m a believer!! PINTO = Put In New Transmission Often……. 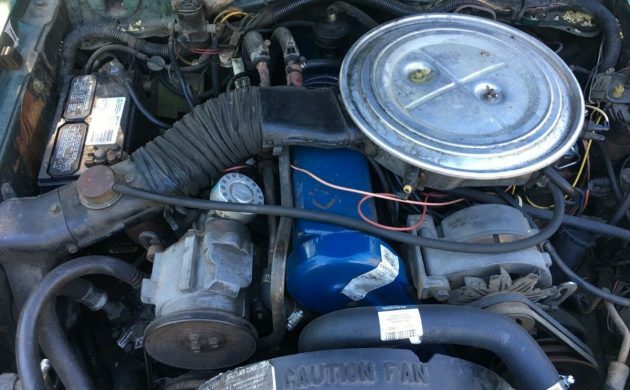 This Pinto would be great with a 2.3 Turbo motor out of a Merkur XR4ti installed. Hmmmm, I have one of those on my garage floor. The “kaboom” problem was fixed from 1976 or so on. I can’t imagine why someone would bother with power steering and power brakes on one of these; it’s not like they required a whole lot of foot power to stop or a whole lot of arm power to turn. My parents had the sedan rather than the hatchback. I’m not sure why they didn’t get the hatchback. Having owned sedans their entire lives I think the huge expanse of glass on a rear hatch made them nervous, or something? I don’t know, I was 11 when they bought the car. When I turned 17 and got my license, they still had it; it became the car I drove on a recurring basis. The trunk is small and the rear seat doesn’t fold. The trunk opening is oddly shaped and precludes loading bulky cargo. My parents called it a “letter slot”. It’s good for maybe a couple of small suitcases or a few grocery bags, that’s it. The car had the 2.3, automatic, and no A/C. Acceleration was NOT adequate, especially given where we lived (northern NJ). Pulling out onto a “Jersey freeway” (50-55mph divided highway lined with retail driveways) involved prayer. I can’t imagine how bad the acceleration would have been with the A/C turned on. Back in the day I was on a road trip in one of these- my girl friends car. We were out in the hinterlands of Ohio on I-75 when we heard a tremendous bang, almost like an explosion. With the reputation these cars had we were thinking the worst. We pulled over, got out and I checked Everything. Couldn’t find anything amiss so got back in and continued on our way for hundreds of miles without incident. A mystery to this day! A pal of mine at work bought one of these in one of the last years of production. He had it decked out with a lot of options but kept the stick. What I couldn’t understand is he got this multi-speaker set up but would not cough up the extra few dollars for a stereo radio!! It was a nice looking car and he kept it for quite a while and quite a few miles. I think Pintos got kind of a bad name as it was in competition with the Vega which was a bad car. On the other hand, I had a friend in college who had “a napalm edition with Firestone 500 radials”. He survived. I miss my pinto …. both of them ! Love the color combo on this. I one knew someone who thought Dodge made Pintos. A few years ago a girlfriend of ours had a friend in the National Guard who was driving an ANG-sponsored Late Model stocker at the dirt track up in Victorville, CA, and got us to go along to a few racing evenings. Loads of fun! The big attraction for me was the Mini-Stocks, which I’d enjoyed in Nashville, but on dirt they were really special. The standouts were ALL Pintos! I had been wondering where all the old Pintos had gotten to … I guess it was Victorville! A few laps into the first race, the reasons for that became obvious: The cars are light enough to stay on the surface, well-balanced enough to handle any turn, whether sliding or just driving through, and FAST. There were always a few Toyotas or Datsuns, and a couple of sad-sack Vegas, but forget those. A Pinto was not a guaranteed win, but without one you never would. I am agreeing with chrisful here. If I ever see a nice clean wagon I just might give up my DD Forester. 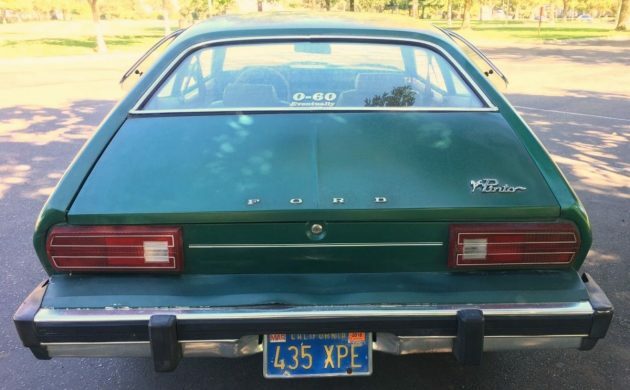 The Pinto is a car that has gotten prettier to my eyes over the years, and between its basic simplicity and easy upgradeability it has the potential for being yet another actually immortal Ford. Had this model but in white. My GF at the time declared “I need a car” while we were living hand to mouth in a crummy trailer park near the airport. I said no but she went behind my back and got the cheapest piece of s**t off a used car lot. It was gutless and couldn’t get out of its own way. It would poop out frequently for some reason or another. Once, a lady tagged our bumper, got out, looked at it and said it wasn’t that bad, got back in her car and drove off. She knew it was a sh*t car not worthy of her time exchanging insurance info and we knew it too. 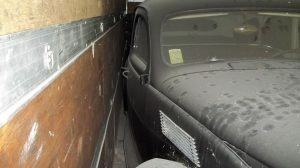 The last straw for the GF was when she stalled out at a super busy intersection and got honked at mercilessly until a guy used his truck to shove it into a parking lot. He thought he was getting a date for helping. She disabused him of that idea post haste. My last straw was when it died near a druggie hitchhiker. He thought I was picking him up and jogged the 40 yards to the car. He opened the pass door (the lock never worked) and wanted to head towards Tacoma. I said it’s not going anywhere. He thought I was kidding and sat in the seat while I was getting out. I left him there in the car while I started walking to a pay phone (pre-cellphone era) to get a buddy to tow it. I was so pissed, that I didn’t care what happened to it. When we got back to the car hours later, we noticed the dude had ripped off all the sticky pennies in the ashtray and a few cassette tapes. 1987 to ’89 was a very low point in my life. No money, a crummy retail job and a very impulsive, flaky GF. Did you ever take it to a mechanic to fix that stalling problem. They are not sophisticated cars and easy to fix. By the way, the Pinto continues to be my favorite car. I have had many of them and never been let down by any of them. Cheap to buy and easy to fix in your driveway. The early Pintos came with a tool and instructions on how to do a few adjustments on the car with it. We couldn’t afford to bring it to a shop and we were not mechanically inclined to troubleshoot anything. We literally ran it into the ground and then my GF bought a Mustang II which was only slightly better. This is a beautiful car! Why not take it out of the shade and take pics there?? It would show a whole lot better. 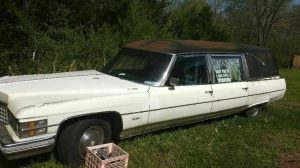 I had a ’75 Pinto wagon with a 171 ci, 2bbl and automatic. Tan with two tone tan interior and tweed seat inserts. I’ve been kicking myself in the seat of the pants ever since the day after I got rid of it. It was a great car! No gas tank problems. Comfortable, economical, handled quite well. Took care of it. Never overloaded it or abused it. This one has the deluxe interior. Those seats are part of an option package. Sedan trunk space about 6 cubic feet. To compare: a Maverick or a Hornet had about 10.